DBR laser diodes are designed and fabricated with mission-critical performance in mind. Throughout the mission, the laser – the heart of the instrument – must perform at-power, at-wavelength, and on-lock. As a result of their proprietary design and process technology, Photodigm’s 9xx-10xx nm single frequency DBR lasers are chalking up projected lifetimes approaching one million hours. Even with the high aluminum epitaxial material used in 7xx-8xx nm devices, Photodigm devices certfied for potassium, rubidium, and cesium spectroscopy are delivering lifetimes in excess of 10,000 hours. The reliability of semiconductor lasers depends on many factors. Elements contributing to failure include strains in the epitaxial material due to the design, defects introduced during the epitaxial growth, defects from the photolithographic process, strains induced by dielectric and metal layers deposited during the fabrication of the device, stresses introduced in packaging, and finally, the operating environment. The laser engineer must be aware of all of these factors and must design accordingly. Furthermore, spectroscopic lasers have an additional operational requirement – the ability to remain locked to a specific transition for the life of the mission. Age-related failure to find lock has only recently been recognized. Because it is related to device architecture and is observed only in certain applications, Photodigm has discussed this in a separate applications note, Perma-Loc™ to Atomic Resonance. The three main types of failures seen in all laser diodes are infant mortality, external hazards, and wear-out. 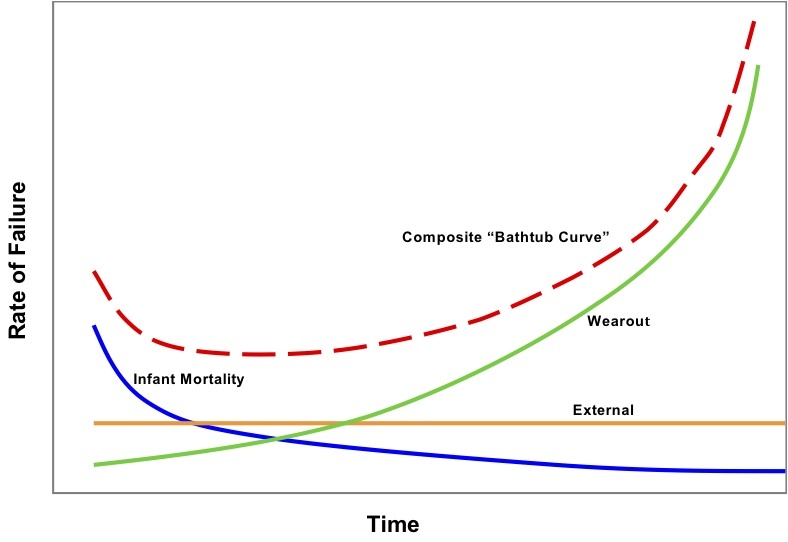 Defects in manufacturing and intrinsic semiconductor defects result in infant mortality. The rate at which these failures occur diminishes quickly as the devices are used. Influences coming from outside of the device, such as electrostatic discharge are external hazards failures. The rate at which these failures occur is constant for an unchanging operating environment. Growth and propagation of non-radiative optical absorbing defects in the semiconductor result in device wear-out. The rate at which these failures occur increases with increasing operation time. The composition of these three failure types yields a general device failure characteristic, known as the “Composite Bathtub Curve,” shown on the next page. where k is Boltzmann’s constant, and Ea is th activation energy, which is determined by the failure mechanism causing the degradation. Semiconductor lasers degrade due to a variety of factors; these factors include imperfection in the wafer growth, unwanted strains induced by the epitaxial architecture, contaminations, imperfections, and stresses from the photolithographic processes performed at the wafer level, and imperfections from packaging of the individual laser chips. Despite the range of degradation mechanisms that can cause a semiconductor laser to fail, the majority of failure mechanisms have activation energies ranging from 0.2 to 0.7 eV. where Ii is the drive current corresponding to TTFi; and n is the current degradation factor, typically ranging from 1.5 to 2.0. The lifetime testing for our semiconductor lasers is performed under automatic power control (APC). Under APC operation, the optical power emitted from the laser is held constant by adjusting the drive current into the device. Because semiconductor lasers can have lifetimes in the range of decades, monitoring the slow increase of laser current overtime as the laser degrades is the preferred way to measure laser lifetime. The current is recorded for several thousand hours and its rate of change is used to project the lifetime of an individual device. The laser is deemed to have failed when the drive current has risen to 1.5 times its initial value. This is a fairly strict definition of failure as some failed devices are still capable of producing their rated optical power. Once the time to failure for each device is determined for a given set of operating conditions, the mean time-to-failure (MTTF) is calculated under the assumption that the failure times follow a lognormal statistical distribution. Generally, the activation energy and the current degradation factor can be determined through a maximum-likelihood estimation. However, this requires a large sample size in order to obtain reasonable statistics. Three different operating temperatures and three different power levels, with at least 8 devices at each operation condition, would be required to make a reasonable estimate of the activation energy and current degradation factor. This determination of parameters could be carried out with a minimum of 40 devices in each batch. we instead assume an activation energy of 0.5 eV and current degradation factor of 1.8 from literature. These values have been shown to fit well with our cumulative data. Photodigm uses the AlGaAs / InGaAs materials system for fabricating lasers between 760nm and 1083nm. Lasers above 850nm employ InGaAs quantum wells and have generally reduced Al levels in the waveguiding regions. Lasers emitting below 850nm employ AlGaAs quantum wells and therefore have increasing Al waveguide content approaching 50% by 780nm. Unavoidabley, these higher levels of Al often result in an increased number of defects in the epi crystal material, thus the shorter wavelength lasers below 850nm typically have reduced lifetimes over the longer wavelength devices with similar performance levels. Consequently, we distinguish the performance of our 9xx to 10xx lasers from our 7xx to 8xx lasers. The 1064 nm and 1083 nm epitaxial materials are made from the same material system with some modifications to the active layers to achieve the desired wavelength. Due to the similarity of these epitaxial materials, the lifetime of devices in the 1064 nm and 1083 nm sample lots should be similar, given that processing and packaging are of good quality. One of the first samples of lasers tested included 1083 nm material, in order to qualify the entire laser fabrication process from the basic epitaxial structure, growth, and processing. The drive currents as a function of time are shown in Figure 2. Note that as the devices began aging, the current first started to increase and then began to decrease. This type of phenomena can occur to devices that have a significant amount of tensile and/or compressive stresses incurred during the fabrication processes. As the device ages, these stresses are relieved and device performance can actually improve. Due to this “device improvement”, no projections can be made on the TTF for specific devices showing this behavior. Devices that exhibit this behavior are assigned a low TTF of 20,000 hrs so that some estimate is included in the log normal model. These devices are being driven at an output optical power of 100mW. The devices shown in Figure 2 have a projected lifetime or MTTF of 1,084,000 hrs at 100mW of optical output power and an operation temperature of 25ºC. Figure 2. Lifetime testing of Photodigm 1083 nm DBR laser. Data shows current required to maintain constant 100 mW light output as a function of time. 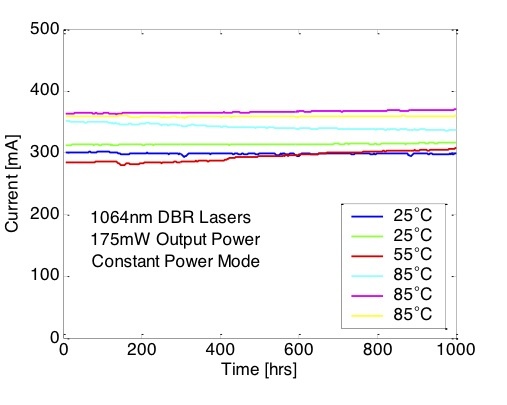 Figure 3 shows a set of 1064 nm DBR lasers life test data. These devices are being driven at an output optical power of 175mW. These devices have a projected lifetime or MTTF of 868,000 hrs at 175mW of optical output power and an operation temperature of 25ºC. Note that devices lagging in time are replacements for devices that died due to infant mortality, and therefore lag by an allotted burn-in time. Figure 3. Lifetime testing of Photodigm 1064 nm DBR laser. Data shows current required to maintain constant 175 mW light output as a function of time. A basic summary of current lifetime projections for Photodigm’s 9xx and 10xx nm DBR lasers is presented in Table 1. The devices in this sample were kept on the reliability tester under the same constant power operation until the hardware was upgraded. 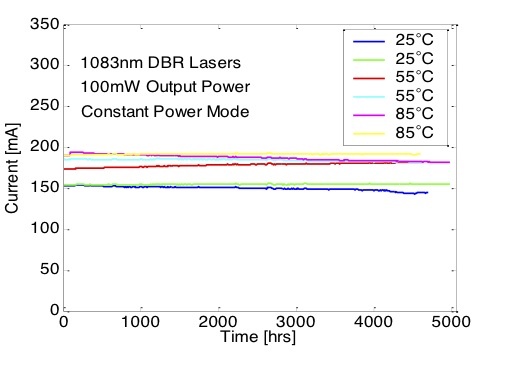 The actual cumulated device hours reached 176,640 hrs for 1083 nm DBR lasers and 51,744hrs for 1064 nm DBR lasers with no end of life wear out failure. These long lifetime results demonstrate Photodigm’s capability to qualify epitaxial material, optimize waveguide and grating design and process robust DBR laser structures. The 852 nm and 780 nm DBR lasers have been recently developed with the targeted output powers of 300 mW and 200 mW respectively. The primary output power limitation for the single mode 780 nm DBR laser diodes has been due to the onset of catastrophic optical mirror damage (COMD). Design optimization on epitaxial refinement and mode field spot diameter has helped to reduce the optical power density at the laser output facets. Figure 4. Lifetime testing of Photodigm 780 nm DBR laser. 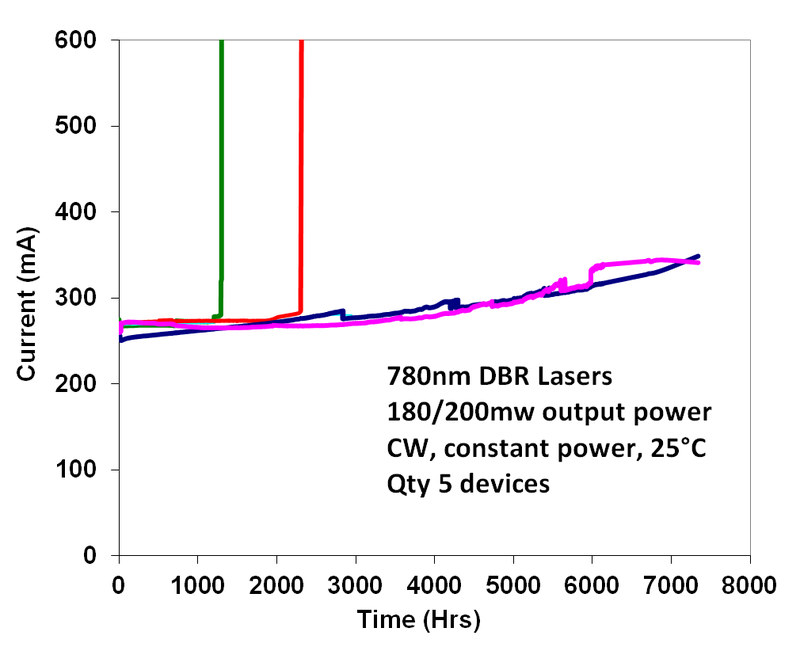 Figure 4 shows a set of early 780 nm DBR lasers that are currently under lifetime testing. Both random and wear-out failure modes are present. Whereas in the ongoing 852nm DBR laser life test data, no wear-out failure modes are observed yet as shown in Figure 5. All random failures are sudden failures. Analysis on their root causes are underway. Figure 5. Lifetime testing of Photodigm 852 nm DBR laser. A basic summary of current lifetime projections for Photodigm’s 7xx and 8xx nm DBR lasers is presented in Table 2. Noteworthy is that as devices age beyond 4,000 hours, no COMD wear out modes are observed, suggesting a reliable facet passivation technique. Table 2. Summary of 7xx-8xx DBR laser lifetime. Perma-Loc™ to Atomic Resonance, Photodigm applications note, dated 2012, and available on the website for download. M. Fukuda, Reliability and Degradation of Semiconductor Lasers and LEDs, Artech House, Inc., Norwood, MA 1991. O. Ueda, Reliability and Degradation of III-V Optical Devices, Artech House, Inc., Norwood, MA 1996. For further information, please contact Photodigm.